Aromavex Reviews (NEW 2019) - Does Aromavex Work? 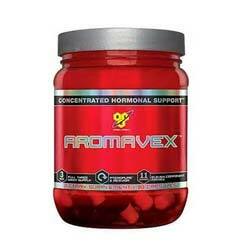 Aromavex is simply described as being a hormone regulator. Manufactured by BSN and sold through various online supplement retailers. The official BSN website also offers this supplement if consumers do not want to go through a third-party retailer. For satisfaction guarantee policies, however, users have to research the policies of specific retailers. A single bottle of Aromavex should last for about three weeks if taken according to the “three pills per day” usage instructions. Unlike some other health supplements, Aromavex is meant to be taken as a “sister supplement” to other hormone support supplements. What are the Ingredients in Aromavex? Aromavex’s formula is boasted to be specially formulated to help with the absorption and utilization of hormones produced through the stimulation of other hormone-related supplements. This formula contains vitamin D, calcium, calcium-d-glucarate, mangosteen extract, Prunella vulgaris extract, Barbary wolfberry extract, Turmeric extract, bee propolis, grape seed extract, pterostilbene transresveratrol, black pepper extract, Bioperine, and cholecaliferol. The gelatin, silicon dioxide, magnesium stearate, microcrystalline cellulose, FD&C Red #3, titanium dioxide, FD&C Yellow #6, FD&C Red #40, and FD&C Blue #1. Aromavex can only deliver optimal benefits when its use is combined with a healthy exercise schedule and a nutritious diet. Additionally, users of Aromavex should be also be supplementing their diets with other hormone-inducing supplements in order for Aromavex to actually have something to “work” on. However, consumers can also use this supplement immediately after they finish with a testosterone-support cycle if they desire that option instead as well. What are the Benefits of Aromavex? What are the Drawbacks of Aromavex? Clinical studies have not been done on this product to prove its claimed efficacy. This product is not meant to be used on its own; other hormone-related supplements are required as well. Aromavex is promoted as being an essential sister-supplement to other products, but the actual practicality of it seems to be questionable. Clinical studies to prove that Aromavex effectively improves the results gained through using other hormone-support supplements are not cited online, and user reviews are not really featured either. Additionally, not all purchases of this supplement appear to be endorsed by a money-back satisfaction guarantee policy. It is, however, recommended to research more products online as well as offline before making the decision of buying this product.